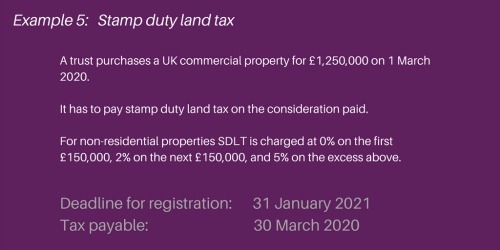 With the aim of providing greater tax transparency going forward, and as part of its ‘Making Tax Digital’ agenda, HMRC has introduced a new online Trusts Registration Service. The requirement to register complies with the Fourth Money Laundering Directive and applies to both onshore and offshore trusts. Here we take a look at who is affected and offer some examples of how and when a trust should be registered. Any trust, anywhere in the world, that has a UK tax liability. Trustees are assumed to be aware of events that may give rise to a UK tax exposure for the trust. A trust is required to register regardless of the size of its tax liability. 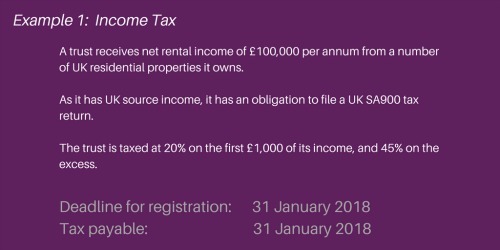 There is uncertainty as to whether this includes a situation where the trustees have an obligation to file a UK tax return but there is no tax liability e.g. makes a loss. When does the trust need to register? 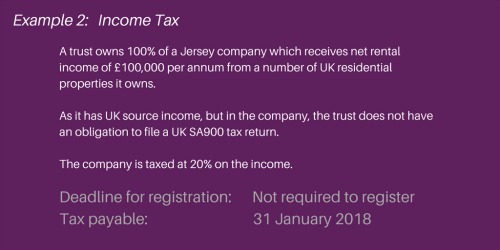 The trust needs to register on 31 January in the year following the tax year in which the trust had a UK tax liability. The first deadline for registration is 31 January 2018. 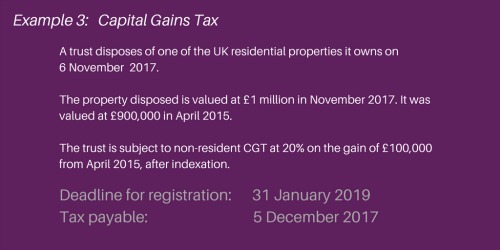 For those trusts that have not had a UK tax liability in the past or that have previously registered, an annual review is required to check whether they are required to register. N.B. it is possible to obtain closure letters from HMRC for any trusts which may no longer have a liability to UK tax. In terms of the individuals associated with the trust, this is defined as all 'beneficial owners'. This is as far reaching as identifying and reporting on ‘potential beneficiaries’ i.e. beneficiaries specifically named in a document such as a letter of wishes that may only be listed in the trust deed as a class of beneficiary. HMRC will rely on the letter of wishes as well as the trust deed as evidence. The UK Trusts Register can be found here. If you would like to discuss any of the implications of the Trusts Registration Service please contact Hannah Roynon-Jones at Alex Picot Trust.